Stapleton Farm Sale horses have correct dressage basics and all history and vet work is disclosed. In addition to classical dressage training all horses go out of the arena and school in the fields as well as cross train with cavaletti and poles to produce a well rounded happy horse. Contact Ruth with questions or to set up a time to view a horse. Contact us if you have a horse you would like to place on consignment sale. See our ﻿breeding page﻿ for youngsters. Fergie is a sweet and talented mare. She was started late due to belonging to a breeder and having a lovely foal as a 4yr old. We purchased her as a sale prospect and have not been disappointed. She has a very kind temperament and 3 good gaits with the canter being a highlight. 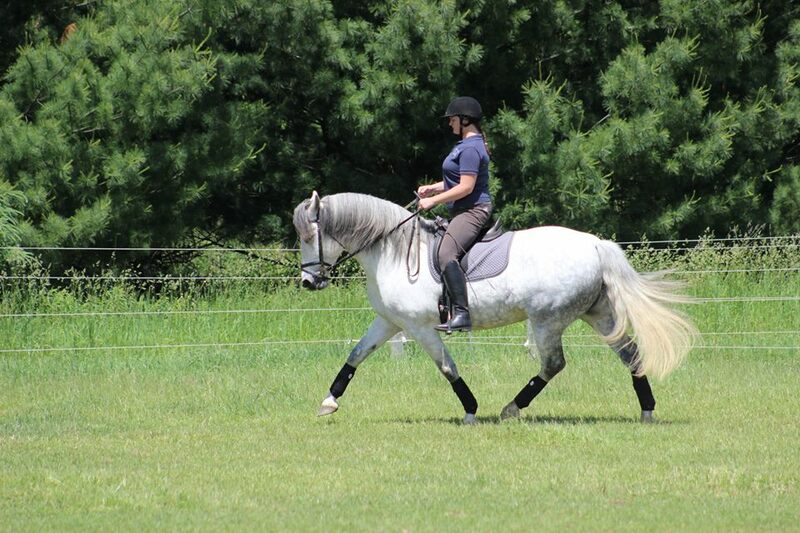 She has a very pleasant way of going with a quick active hind leg that stays underneath her. She is sensitive but sensible therefore we suggest an experienced AA, Junior or pro. ​Her dam was an oldenburg mare that had a career in the hunter jumper world and her sire is a Dutch Harness horse sired by Fabricuis and out of a mare with Renovo as the grandsire. She does not currently have papers. She can be registered AWS. ​She has hock and front feet xrays and a clean PPE in October of 2018. Dhelta is a lovely 2013 mare. Her sweet engaging personality make her the ideal Junior or AA horse. She is sensible with 3 nice gaits. She has been to a busy show atmosphere and handled it like a seasoned horse. She has also been started over fences lightly. Her bright color and chrome make her a flashy eye catching horse. at 16.2 she is the ideal size. She is light in the bridle and straight forwards to ride. Loads, bathes, clips and hacks out on the trails quietly. 20K with a full set of xrays available. May consider a partial trade. Lena is as sweet and quiet as they come - by Farscape out of a For the Future mare. Standing just shy of 16.1h she is a lovely size mare with a great temperament, She was allowed to mature at the breeders and started as a 4yr old when her current owner purchased her. She quietly hacks around the trails alone or with others, rides through the woods and goes down the drive. She is a quick learner and has a quiet confident personality. She is extremely sweet and loves her person - not mareish at all and a great work ethic. Suitable for an adult am. Isle is a lovely young mare. She is sister to the Iron Springs Farm Stallion Sir Sinclair as they share the same Dam - Krishna by Flemmingh. This sweet mare will finish 17.2h and has lovely elasticity to her gaits. She has an exceptional temperament and is people oriented and kind. Great opportunity for a breeder! Isle is out of Krishna- a Star, Sport and Preferent mare who also produced the stallion Sir Sinclair. Krishna is by Flemmingh, the sire of Lingh and Krack C. Isle is by Charmeur (Florecio I x Jazz x Ulft) a stunning young stallion. Luna is a barn favorite. This lovely 3yr old AWS mare is extremely steady and quiet for her age. She rides inside or out in the field alone or in company. Works nicely walk, trot and canter as appropriate for her age. She has 3 nice quality gaits and is forwards without being spooky and silly. Great opportunity for someone looking for some talent to go up the levels in dressage on a budget. Attending her first show 6/12/16 - get noticed with some color! Diablo is schooling Third Level with easy clean changes. He has shown through Second Level with First Level scores to 70% and Second Level scores in the 60's. Very easy shoulder in, haunches in and half pass. Excellent medium trot work. Same at the show as he is at home. He goes well in both the Snaffle or Double. Very easy trot to sit. Overall a quiet horse but not suited for a total beginner. 15.2h with a big barrel - rider in pics is 5'10. his lovely Colt has a sweet and friendly personality. He is going to be a leggy tall boy! Sire is Freestyle a Premium Black Westfalen Stallion, Class 1 Status - (Florestan X SPS Paloma) Freestyle has a German Dressage Index of 151 points, the highest in North America, and in the TOP 1% of all German Dressage stallions. Dam is Golden Soprano - A Thoroughbred mare with 3 lovely gaits and a very sweet temperament. Shown at USDF shows with a Junior rider she has been very successful in the dressage ring. She will be presented at the Oldenburg Inspection with her colt in August. Lovely mare by Sir Sinclair out of a Ferro mare. Big bodied and tall at 16.3h yet elegant mare. Three good gaits with an excellent walk. Good show record through First Level - high 60's/70's. Excellent addition as a broodmare. Sensitive but sensible. Lightly started under saddle - Super prospect. 16.1h should finish 16.2/16.3h - could go any direction - 3 very balanced gaits with super presence and scopey jumper. Has jumped 3'8 lose with easy.